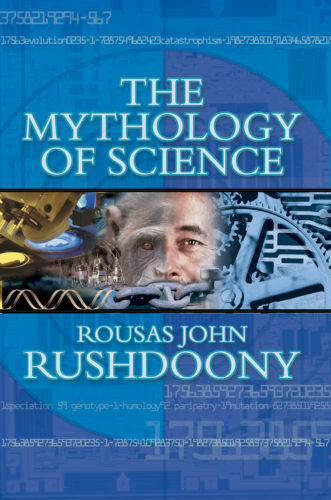 The "mythology" of science is its religious devotion to the myth of evolution. In evolution, man is the highest expression of intelligence and reason, and such thinking will not yield itself to submission to a God it views as a human cultural creation, useful, if at all, only in a cultural context. Views of origins are dependent on faith, and one's position speaks much as to one's religious tenets. Evolutionary faith, however, cannot tolerate any view of the natural world or science that places it under another faith, such as the Christian belief in a sovereign causative God. Darwin gave an ostensibly scientific justification for man's rebellion against God. He put men at the top of the evolutionary ladder, allowing them to believe they had realized Satan's lure to Adam and Eve and become "as gods, knowing [determining] good and evil" (Genesis 3:5). We can attack the science of evolution all we want, but the battle for our faith, true science, and our culture is a religious one over the nature of truth. Evolution is a religious faith that has become entrenched as a presupposition of modern thought. For Christians to argue about the "unproven" nature of the evolutionary hypothesis or the circular reasoning of its thought is of some value, but the essential issue is that two opposing religious faiths are in conflict. Evolution is popular because it is such a useful paradigm to sinful men; it dispenses with God as a prerequisite of all things. But Christianity as a religious faith depends not on proofs that are constructions of man's fallen mind, but on the reality of an almighty God who reveals Himself to us by grace. Christianity, too, depends on circular reasoning: we even begin and end with faith in God and His revelation. The purpose of this book (first published in 1967) is to define the nature of the opposing religious systems of thought, Christian creationism and Darwinism (in its various forms). It is a call to urge Christians to stand firm for Biblical six-day creationism as a fundamental aspect of their faith in the Creator.